On Friday, July 21st, I had the pleasure to facilitate a workshop on building a healthy and equitable food system at the 2018 She the People! Summer Camp at the Palmer Park Community Center. This session was part of a two-day series of student conversations on increasing food access and building food equity in Prince George’s County. During the workshop, I highlighted the role of County residents in participating in the local food system, not just by growing their own food, but also by encouraging policymakers to find innovative solutions to address food insecurity through amendments to zoning regulations, tax incentives and other local policies. Understanding zoning is important for food access because zoning regulations are the laws that determine how land can be used and all food comes from the land. These laws determine where food can be grown, the proximity between housing, schools, offices, and food retail locations, and the types of transportation connections (roads, sidewalks, trails, public transit) that exist to help people travel between locations. Through quick mapping exercises, students were able to see that some communities in Prince George’s County lack safe, reliable access to fresh fruits and vegetables. For example, there are no grocery stores within a mile of the Palmer Park Community Center and four grocery stores within a mile of the PG Plaza Community Center. The group used ARCGIS to create a map identifying food retail establishments in Prince George’s County and measuring their distances from their schools, and created data-driven definitions for food deserts, food swamps, food oasis, and walksheds for their communities. By the end of the session, participants had a better understanding how they could leverage their political power to advocate for better food systems in Prince George’s County through direct service activities like establishing their own community garden, volunteering with the County’s Food Equity Council, or by conducting community assets maps. 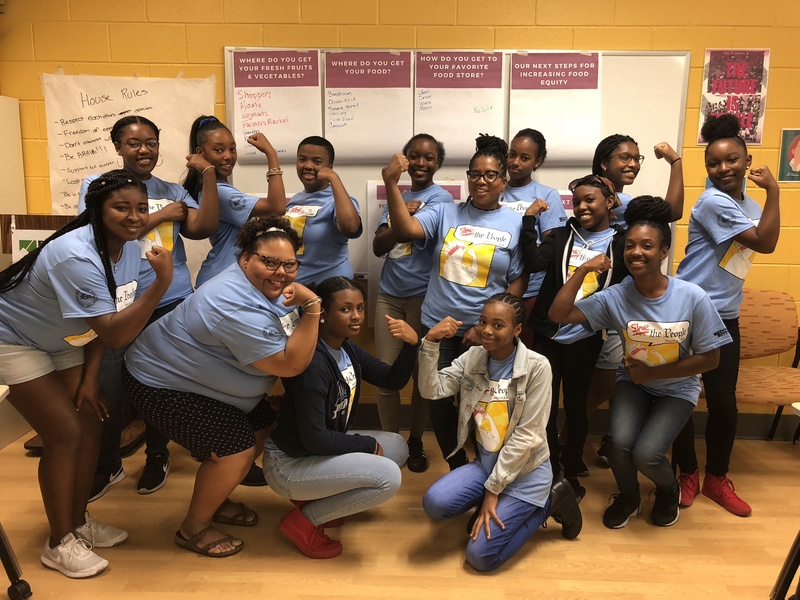 She the People!, is a two-week summer camp, hosted by the Prince George’s County Department of Parks and Recreation that is designed for teenage girls to learn about the path to getting involved in local government and gain hands-on experience in the structure of our political system.